A Goldstone 111.5-foot (34-meter) beam-waveguide antenna tracks a spacecraft as it comes into view. 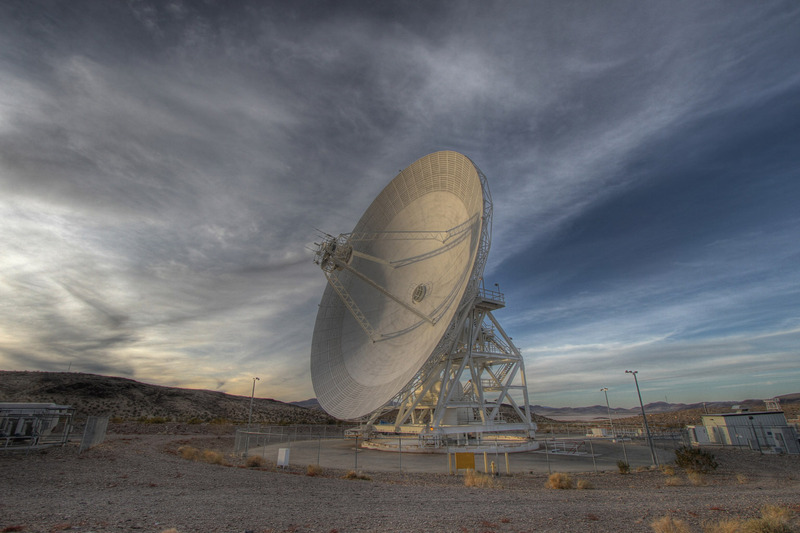 The Goldstone Deep Space Communications Complex is located in the Mojave Desert in California. Engineers at NASA's Jet Propulsion Laboratory in Pasadena, California, will use antennas like this one to transmit a new set of commands to the Opportunity rover in an attempt to compel the 15-year-old Martian explorer to contact Earth.Image credit: NASA/JPL-Caltech. This photograph was taken on Jan. 11, 2012. The new transmission strategies are expected to go on for several weeks. They address three possible scenarios: that the rover's primary X-band radio - which Opportunity uses to communicate with Earth - has failed; that both its primary and secondary X-band radios have failed; or that the rover's internal clock, which provides a timeframe for its computer brain, is offset. A series of unlikely events would need to have transpired for any one of these faults to occur. The potential remedies being beamed up to address these unlikely events include a command for the rover to switch to its backup X-band radio and commands directed to reset the clock and respond via UHF. Time is of the essence for the Opportunity team. The "dust-clearing season" - the time of year on Mars when increased winds could clear the rover's solar panels of dust that might be preventing it from charging its batteries - is drawing to a close. Meanwhile, Mars is heading into southern winter, which brings with it extremely low temperatures that are likely to cause irreparable harm to an unpowered rover's batteries, internal wiring and/or computer systems. 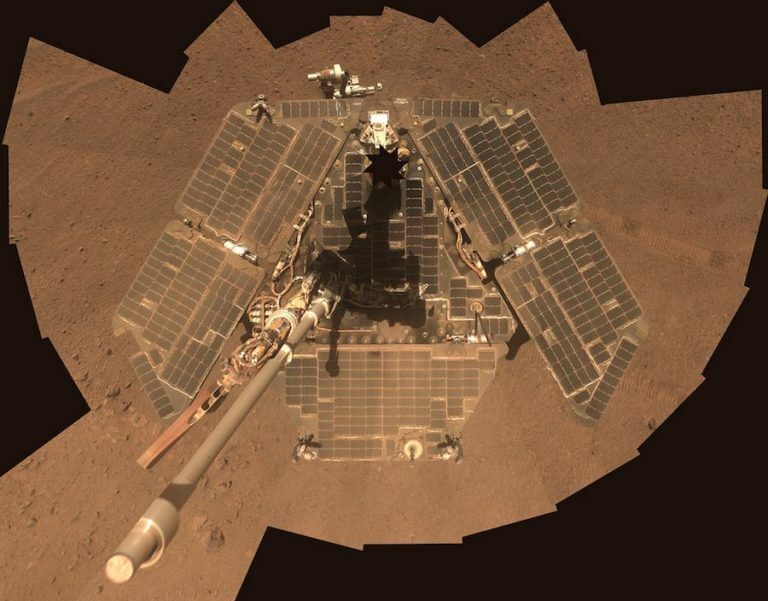 NASA’s Mars Opportunity rover landed on Mars 15 years ago this week, but the long-lived robot remains out of action in the wake of a global dust storm last summer that caused it to lose power. Engineers are still trying to contact the spacecraft, sending commands and listening for any sort of response, but hopes are fading, a senior manager said Friday. For many of the engineers and scientists that built and nurtured Opportunity over the years, the six-wheeled robot is almost a member of the family, and no one wants to say that final goodbye until every possible rescue option has been exercised. But seven months after contact was lost, that moment is approaching barring a sudden reversal of fortune. It’s the windy season on Mars, and there remains a chance gusty breezes might blow off enough accumulated dust from Opportunity’s solar cells to allow its batteries to charge up enough for the spacecraft to phone home. 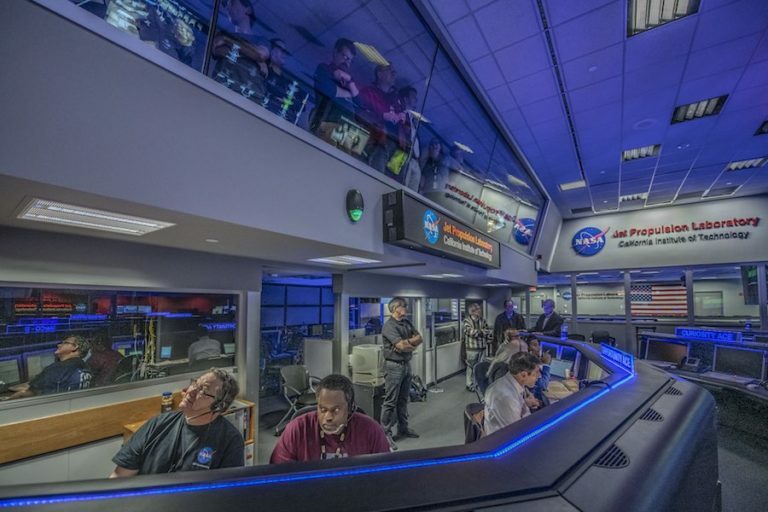 At the same time, flight controllers at JPL continue to send commands “in the blind” in an attempt to coax Opportunity back into action if it ever does wake up while NASA’s Deep Space Network antennas regularly listen for a response. But if the batteries were fully depleted, as now appears likely, the spacecraft’s internal clock would reset and “the rover won’t know what time it is,” Callas said. “And so, it’ll attempt to wake up at these odd hours of the day or night, so we might not hear from it when it is powered up because it’s got the wrong time. But so far, flight controllers have heard nothing. Opportunity landed on Mars, on a plain known as Meridiani Planum, on Jan. 24, 2004, 15 years ago this Thursday. The design specifications called for a minimum 90-martian-day mission and an ability to rove at least 1,100 yards. But Opportunity and its twin rover, Spirit, far exceeded expectations, chalking up year after year of slow-but-steady exploration, looking for signs of past habitability and confirming a warmer, wetter environment in the distant past. Spirit got stuck in deep sand and ceased operations in 2011, but Opportunity pressed ahead, showing signs of wear and tear over the years but remaining in remarkably good health. Instead of the 1,100-yard design goal, the rover has covered more than 28 miles, marking its 5,000th day on the red planet last February. But last June, a record dust storm boiled up, becoming a global event that shrouded the red planet in a thick haze, sharply reducing the amount of sunlight reaching Opportunity’s solar cells. Flight controllers last contacted the spacecraft on June 10. The storm persisted for weeks before finally dissipating. Relatively clear skies returned, but JPL has not been able to restore contact with Opportunity. In the meantime, the planet’s seasons are changing, temperatures are dropping and the amount of sunlight reaching Opportunity is decreasing. JPL is operated for NASA by the California Institute of Technology as a Federally Funded Research and Development Center, or FFRDC. As such, it receives payments from NASA in advance and currently remains in operation despite the ongoing partial government shutdown. Callas said his small team will continue efforts to contact Opportunity until NASA is back in operation and able to provide guidance. WASHINGTON — NASA announced Feb. 13 that it was ending efforts to restore contact with the Opportunity Mars rover, bringing its mission to an end more than 15 years after it landed on the planet. At an event at the Jet Propulsion Laboratory, project officials and NASA leadership said they were declaring the overall Mars Exploration Rovers project over after months of attempts by spacecraft controllers failed to reestablish communications with Opportunity after a major dust storm cut off power to the rover in June. “I am standing here, with a sense of deep appreciation and gratitude, to declare the Opportunity mission as complete, and with it the Mars Exploration Rovers mission as complete,” said Thomas Zurbuchen, NASA associate administrator for science. That decision came after Opportunity failed to respond to a final set of commands transmitted to it by the Deep Space Network Feb. 12. 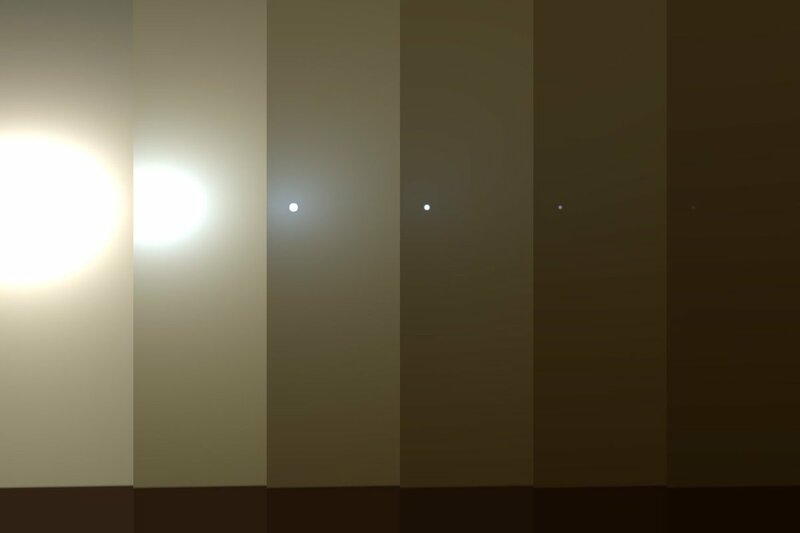 Opportunity last contacted Earth in early June as “an historic” global dust storm reached its location on Mars, said John Callas, project manager for the Mars Exploration Rovers at JPL. That storm darkened the skies and cut off of the rover’s solar power. “We tried valiantly over these last eight months to try to recover the rover, to get some signal from it,” he said. However, the onset of winter at the rover’s location on Mars, a region called Perseverance Valley, meant less sunlight and colder temperatures, making it increasingly unlikely the rover could be recovered. Opportunity was the second of the twin Mars Exploration Rovers to land on Mars, arriving in January 2004 about three weeks after Spirit landed. The rovers had 90-day lifetimes, but each far exceeded that. Spirit’s mission ended in May 2011 after traveling eight kilometers, while Opportunity logged 45 kilometers before losing contact last June. Callas said the extreme longevity of the rovers could be credited in part to winds that cleared dust that had accumulated on the solar panels that, if not removed, would have diminished the power those panels generate. The rovers’ batteries also exceeded expectations, retaining 85 percent of their original capacity after more than 5,000 charge/discharge cycles. A glitch with Opportunity that dates back to very early in its mission may have contributed to its demise. Callas said a heater in the rover’s robotic arm got stuck on shortly after landing, depleting the rover’s batteries during the night. “If we left it alone like that, the mission wouldn’t have lasted long beyond the 90 days,” he said. To correct the problem, engineers developed a “deep sleep” mode to turn off all the heaters each night. When the dust storm hit, the loss of power “scrambled” Opportunity’s internal clock, keeping it from engaging that deep sleep mode each night. “It probably wasn’t sleeping at night when it needed to, and that heater was stuck on, draining away whatever energy the solar arrays were accumulating from the sun,” he said. The JPL event was billed as a media briefing but was more of a celebration of the rover, with project scientists and engineers reminiscing about the mission. Only a few minutes at the end of the hour-long event was devoted to media questions. Steve Squyres, the Cornell University planetary scientist who was principal investigator for the Mars Exploration Rovers, divided Opportunity’s mission into two parts. The first, lasting about nine years, covered initial exploration of its landing site, turning up evidence of water, albeit rather acidic, early in the planet’s history. Asked later in the briefing whether either of the Mars Exploration Rovers might one day be retrieved to place in a museum, Squyres noted that huts from the early exploration of Antarctica, more than a century ago, have been preserved there. The same, he suggested, should be the case for the rovers. “We built them for Mars. That’s the place they were designed to go. That’s their home. That’s where I would like them to stay,” he said. Another opinion, though, came from Ellen Stofan, a planetary geologist and director of the National Air and Space Museum. Speaking at the Commercial Space Transportation Conference here Feb. 13, shortly after the JPL event, she discussed ongoing renovations of the museum and plans for new exhibits. It’s been a long 15 years, but the inevitable has finally happened: the Opportunity rover’s days of exploring Mars are over. The sad news was announced this morning at 2 pm ET in a NASA press briefing, bringing an official end to one of the most successful Mars missions in history. 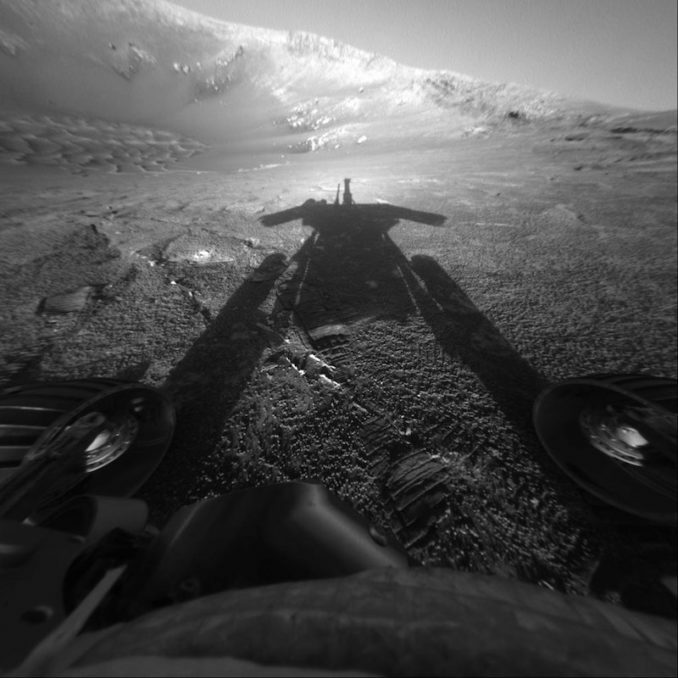 Opportunity, like its twin, Spirit, was designed for a hoped-for nominal mission of 90 Martian days (sols) when it landed in 2004, but lasted for an incredible 15 years. That is 60 times its projected life span. The mission plan also called for Opportunity to travel at least 1,100 yards (1,000 meters), but ended up roving more than 28 miles (45 kilometers) altogether. The trouble began in June 2018, when Opportunity’s location – and most of the planet – was hit with a massive dust storm. June 10 was the last time that the rover was heard from. Up until last night, NASA engineers sent over 1,000 radio commands to try to revive the rover, to no avail. The final transmission was sent via the 70-meter Mars Station antenna at NASA’s Goldstone Deep Space Complex in California. Opportunity had survived dust storms and other hazards before, but this time was different unfortunately. It had been hoped that the rover simply “went to sleep” when the power in its solar panels became too low, and would revive later after the dust storm had ended. But it didn’t. Opportunity had also recently been in a period where stronger seasonal winds would blow off dust more easily, as had happened numerous times before, but that also did not work. So why didn’t Opportunity wake up? 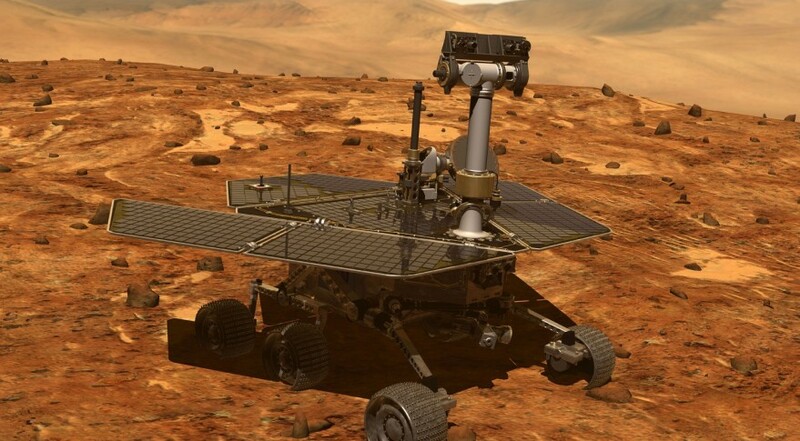 Callas attributes the rover's longevity to 2 main technical things: the lucky seasonal winds providing dust-cleaning events, and the phenomenal overperformance of the lithium-ion batteries, which were at 85% capacity til the end. It may be that simple, that Opportunity just wasn’t able to be revived due to other mechanical and/or software problems, even if its solar panels had been cleaned off of dust. Opportunity landed on Jan. 24, 2004 in Meridiani Planum, 20 days after its twin, Spirit, landed in Gusev Crater. Spirit kept exploring until May 2011, after it became stuck in deep sand and was unable to free itself. 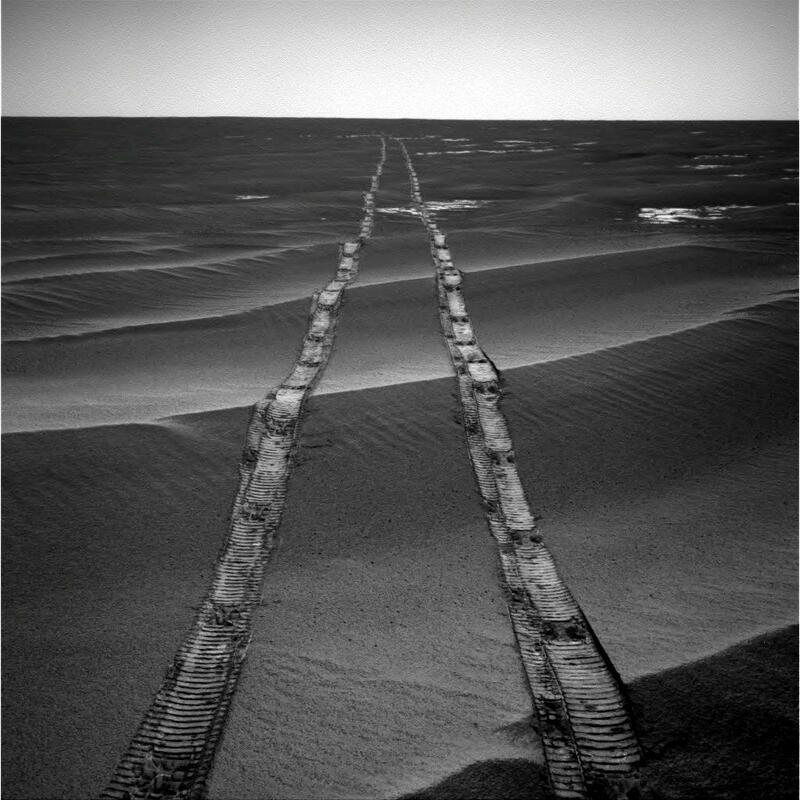 Opportunity escaped its own similar predicament, Purgatory Dune, back in 2005. Opportunity’s landing site was a treasure trove of geologic wonders, with bright patches of bedrock seen in the first images sent back. 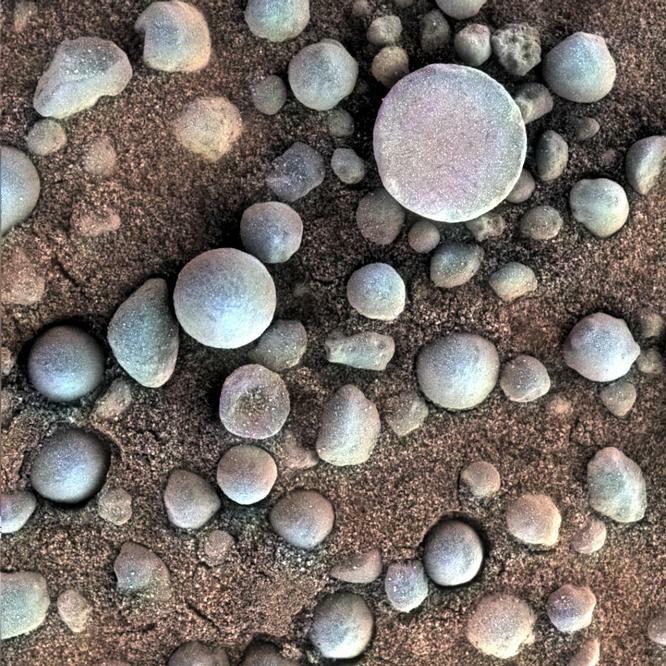 That bedrock provided evidence for past water in the region, as did the famous “blueberries” – hematite concretions, never seen before on Mars. Opportunity also found the first evidence for ancient salty playa lakes and groundwater on this now mostly-dry world. Important discoveries, since the rover’s overall mission was to determine the past habitability of this region of Mars. ...and we watched the skies darken. - Set a one-day Mars driving record March 20, 2005, when it traveled 721 feet (220 meters). - Returned more than 217,000 images, including 15 360-degree color panoramas. - Exposed the surfaces of 52 rocks to reveal fresh mineral surfaces for analysis and cleared 72 additional targets with a brush to prepare them for inspection with spectrometers and a microscopic imager. - Found hematite, a mineral that forms in water, at its landing site. - Discovered strong indications at Endeavour Crater of the action of ancient water similar to the drinkable water of a pond or lake on Earth. 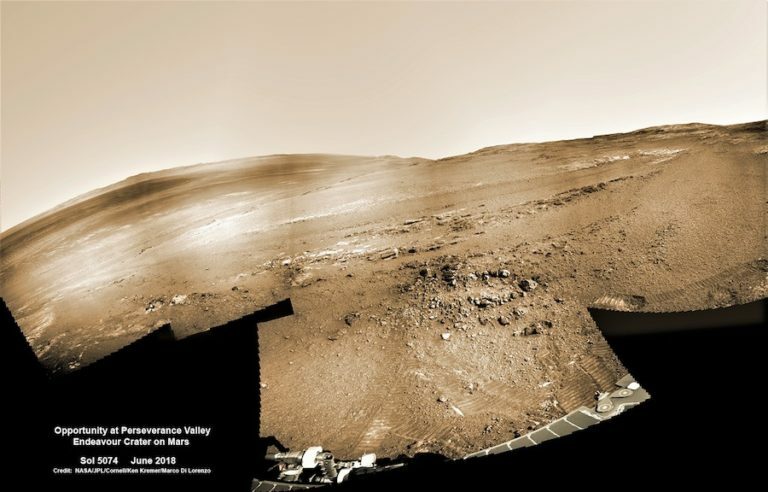 “Opportunity’s final days were spent in Perseverance Valley, an ancient gully thought to have been carved by water or ice, on the edge of Endurance Crater. Meanwhile, NASA’s other Mars rover, Curiosity, continues its mission in Gale Crater and the InSight lander is now ready to start investigating the deep interior of Mars. More information about Opportunity is available on the mission website. Strona wygenerowana w 0.08 sekund z 25 zapytaniami.